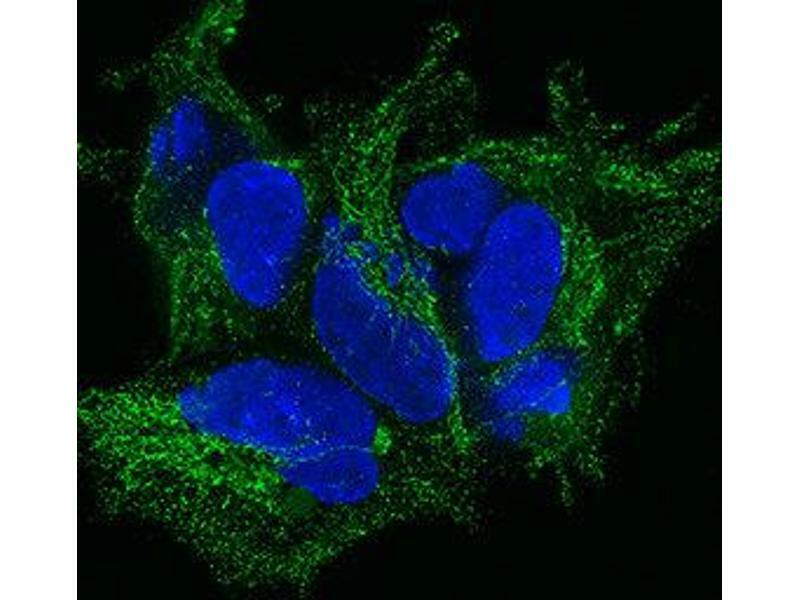 TGF-beta 1 Inhibition of IL-4-dependent Cell Proliferation and Neutralization by TGF-beta 1 Antibody. 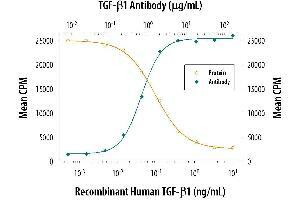 Recombinant Human TGF-beta 1. The ND50 is typically 0.3-1.0 ug/mL. 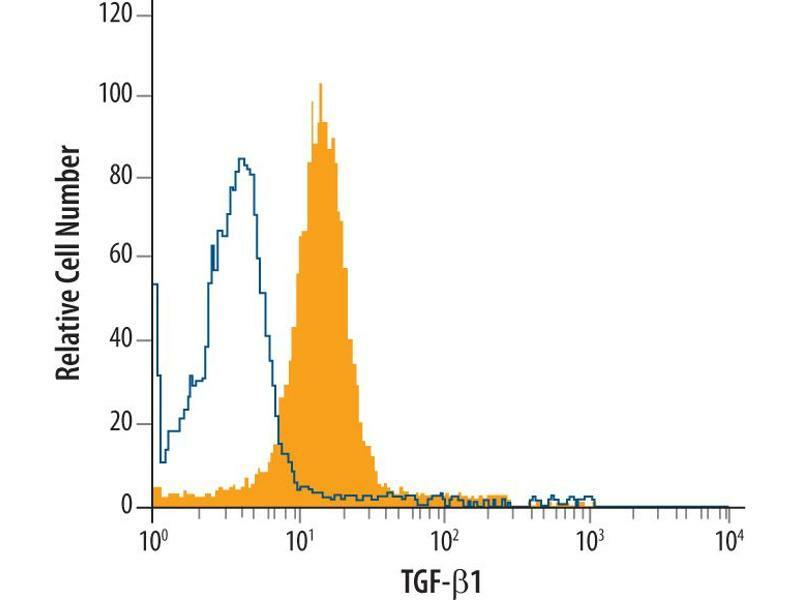 Detection of TGF-beta 1 in PC-3 Human Cell Line by Flow Cytometry. 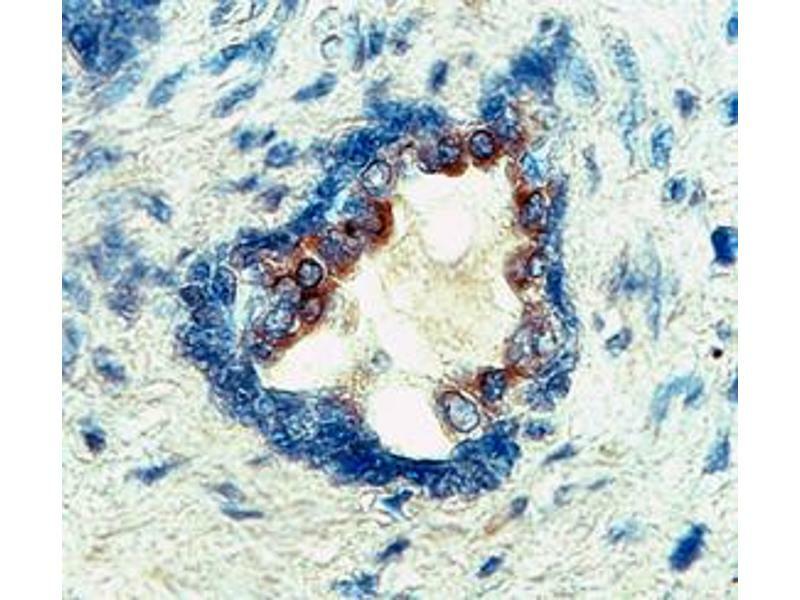 PC-3 human prostate cancer cell line was stained with Mouse Anti-TGF-beta 1 Monoclonal Antibody. 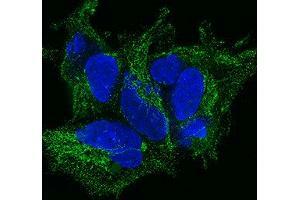 To facilitate intracellular staining, cells were fixed with paraformaldehyde and permeabilized with saponin. TGF-beta 1 in HEK293 Human Cell Line. 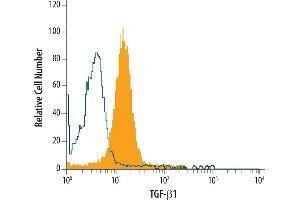 TGF-beta 1 was detected in immersion fixed HEK293 human embryonic kidney cell line using Mouse Anti-TGF-beta 1 Monoclonal Antibody. Specific staining was localized to cytoplasm. Specificity Detects TGF-beta 1 from human, mouse, rat, and other species in direct ELISAs and Western blots. 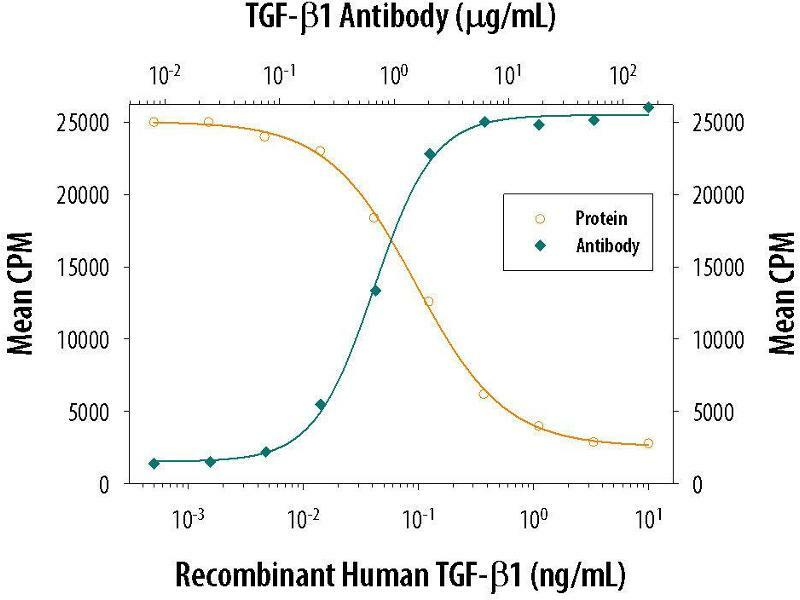 In sandwich ELISAs, less than 2 % cross-reactivity with recombinant human (rh) TGF-beta 3 and recombinant amphibian TGF-beta 5 and no cross-reactivity with recombinant porcine TGF-beta 2 or rhTGF-beta 2 is observed. Sadallah, Schmied, Eken, Charoudeh, Amicarella, Schifferli: "Platelet-Derived Ectosomes Reduce NK Cell Function." in: Journal of immunology (Baltimore, Md. : 1950), Vol. 197, Issue 5, pp. 1663-71, 2016 Method employed by authors: Neutralization (Neut) (Sample species: Human). Liu, Bi, Xue, Zhang, Yang, Chen, Lu, Zhang, Liu, Wang, Wang, Chu, Yang: "Dendritic cell SIRT1-HIF1α axis programs the differentiation of CD4+ T cells through IL-12 and TGF-β1." in: Proceedings of the National Academy of Sciences of the United States of America, Vol. 112, Issue 9, pp. E957-65, 2015 Method employed by authors: Flow Cytometry (FACS) (Sample species: Mouse (Murine)). Ogawa, Ledford, Mukherjee, Aono, Nishioka, Lee, Izumi, Hollingsworth: "Surfactant protein D attenuates sub-epithelial fibrosis in allergic airways disease through TGF-β." in: Respiratory research, Vol. 15, pp. 143, 2015 Method employed by authors: In vivo Studies (in vivo) (Sample species: Mouse (Murine)). Påhlman, Jögi, Gram, Mori, Egesten: "Hypoxia down-regulates expression of secretory leukocyte protease inhibitor in bronchial epithelial cells via TGF-β1." in: BMC pulmonary medicine, Vol. 15, pp. 19, 2015 Method employed by authors: Neutralization (Neut) (Sample species: Human). Spallanzani, Torres, Avila, Ziblat, Iraolagoitia, Rossi, Domaica, Fuertes, Rabinovich, Zwirner: "Regulatory Dendritic Cells Restrain NK Cell IFN-γ Production through Mechanisms Involving NKp46, IL-10, and MHC Class I-Specific Inhibitory Receptors." in: Journal of immunology (Baltimore, Md. : 1950), Vol. 195, Issue 5, pp. 2141-8, 2015 Method employed by authors: Neutralization (Neut) (Sample species: Human). Sommer, Fabri: "Vitamin D regulates cytokine patterns secreted by dendritic cells to promote differentiation of IL-22-producing T cells." in: PLoS ONE, Vol. 10, Issue 6, pp. e0130395, 2015 Method employed by authors: Neutralization (Neut) (Sample species: Human). Kochetkova, Thornburg, Callis, Holderness, Maddaloni, Pascual: "Oral Escherichia coli colonization factor antigen I fimbriae ameliorate arthritis via IL-35, not IL-27." in: Journal of immunology (Baltimore, Md. : 1950), Vol. 192, Issue 2, pp. 804-16, 2014 Method employed by authors: ELISA (ELISA) (Sample species: Mouse (Murine)). Nasuno, Arimura, Nagaishi, Isshiki, Onodera, Nakagaki, Watanabe, Idogawa, Yamashita, Naishiro, Adachi, Suzuki, Fujimiya, Imai, Shinomura: "Mesenchymal stem cells cancel azoxymethane-induced tumor initiation." in: Stem cells (Dayton, Ohio), Vol. 32, Issue 4, pp. 913-25, 2014 Method employed by authors: Neutralization (Neut) (Sample species: Rat (Rattus)). Qu, Li, Zheng, Ren, Puelles, Caruana, Nikolic-Paterson, Li: "Regulation of renal fibrosis by Smad3 Thr388 phosphorylation." in: The American journal of pathology, Vol. 184, Issue 4, pp. 944-52, 2014 Method employed by authors: Neutralization (Neut) (Sample species: Rat (Rattus)). Rodrigues, Matafome, Santos-Silva, Sena, Seiça: "Reduction of methylglyoxal-induced glycation by pyridoxamine improves adipose tissue microvascular lesions." in: Journal of diabetes research, Vol. 2013, pp. 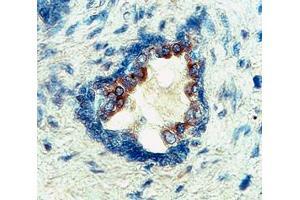 690650, 2013 Method employed by authors: Immunohistochemistry (IHC) (Sample species: Rat (Rattus)). Bialas, Stevens: "TGF-β signaling regulates neuronal C1q expression and developmental synaptic refinement." in: Nature neuroscience, Vol. 16, Issue 12, pp. 1773-82, 2013 Method employed by authors: Immunodepletion (IDe) (Sample species: Mouse (Murine)). Guo, Khattar, Schroder, Miyahara, Wang, He, Chen, Stepkowski: "A dynamic dual role of IL-2 signaling in the two-step differentiation process of adaptive regulatory T cells." in: Journal of immunology (Baltimore, Md. : 1950), Vol. 190, Issue 7, pp. 3153-62, 2013 Method employed by authors: Neutralization (Neut) (Sample species: Mouse (Murine)). Yu, Yang, Jiang, Chen, Wang, Xu, Wei, Cao, Wang, Cai: "Exosomes with membrane-associated TGF-β1 from gene-modified dendritic cells inhibit murine EAE independently of MHC restriction." in: European journal of immunology, Vol. 43, Issue 9, pp. 2461-72, 2013 Method employed by authors: Neutralization (Neut) (Sample species: Mouse (Murine)). Lodge, Ouellet, Barat, Andreani, Kumar, Tremblay: "HIV-1 promotes intake of Leishmania parasites by enhancing phosphatidylserine-mediated, CD91/LRP-1-dependent phagocytosis in human macrophages." in: PLoS ONE, Vol. 7, Issue 3, pp. e32761, 2012 Method employed by authors: Neutralization (Neut) (Sample species: Human). Zhu, Colak, Shenoy, Liu, Mehta, Pai, Zou, Xie, Pasricha: "Transforming growth factor beta induces sensory neuronal hyperexcitability, and contributes to pancreatic pain and hyperalgesia in rats with chronic pancreatitis." in: Molecular pain, Vol. 8, pp. 65, 2012 Method employed by authors: Neutralization (Neut) (Sample species: Rat (Rattus)). Liu, Chen, Huang, Chung, Zhou, Fu, Szalai, Lan: "C-reactive protein promotes diabetic kidney disease in a mouse model of type 1 diabetes." in: Diabetologia, Vol. 54, Issue 10, pp. 2713-23, 2011 Method employed by authors: ELISA (ELISA) (Sample species: Human). Heise, Stober, Cheluvaraju, Hollingsworth, Garantziotis: "Mechanical stretch induces epithelial-mesenchymal transition in alveolar epithelia via hyaluronan activation of innate immunity." in: The Journal of biological chemistry, Vol. 286, Issue 20, pp. 17435-44, 2011 Method employed by authors: Neutralization (Neut) (Sample species: Mouse (Murine)). Gregory, Bracken, Smith, Bert, Wright, Roslan, Morris, Wyatt, Farshid, Lim, Lindeman, Shannon, Drew, Khew-Goodall, Goodall: "An autocrine TGF-beta/ZEB/miR-200 signaling network regulates establishment and maintenance of epithelial-mesenchymal transition." in: Molecular biology of the cell, Vol. 22, Issue 10, pp. 1686-98, 2011 Method employed by authors: Neutralization (Neut) (Sample species: Dog (Canine)). Ma, Han, Greer, Tuder, Toque, Wang, Caldwell, Su: "Calpain mediates pulmonary vascular remodeling in rodent models of pulmonary hypertension, and its inhibition attenuates pathologic features of disease." in: The Journal of clinical investigation, Vol. 121, Issue 11, pp. 4548-66, 2011 Method employed by authors: Western Blotting (WB) (Sample species: Human).